Water Safety New Zealand launched The Swim Reaper campaign in December 2016 aimed specifically at young Kiwi males aged between 15-34 who make up about a third of all preventable drowning fatalities and drowning injuries. The Swim Reaper campaign is funded by ACC and developed by FCB New Zealand. The Swim Reaper, a confrontational character, delivers water safety messages in a direct and consequential manner. Based on dark humour and mockery, this character, and its antics, get the attention of young males who generally aren’t interested in safety messages, nor convinced that they need to know. The Swim Reaper was shortlisted in the Laugh category in the 2017 Facebook awards. 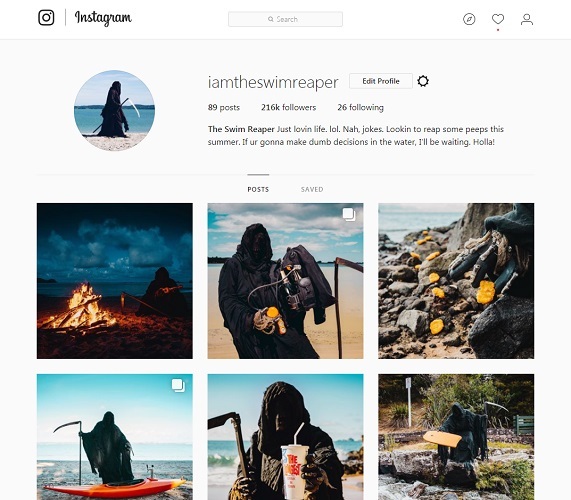 Follow The Swim Reaper on Instagram. Original generation time 1.3939 seconds. Cache Loaded in: 0.0009 seconds.